We are often asked “Who uses CSRHub?” In some cases, the question has been prompted by curiosity. In other cases, a prospective user may want the reassurance that “everyone else” is using our sustainability metrics and decision-making tools. We recently signed up our 7,000th user. While the largest group came from the US, more than half of our visitors come from outside the US. We don’t force our users to tell us a lot of details about themselves. To do so would violate the general trend for web sites to protect and preserve the privacy of their users. However, we do know that more than 400 major corporations use CSRHub, along with all of the major consulting and accounting firms who are involved in sustainability. 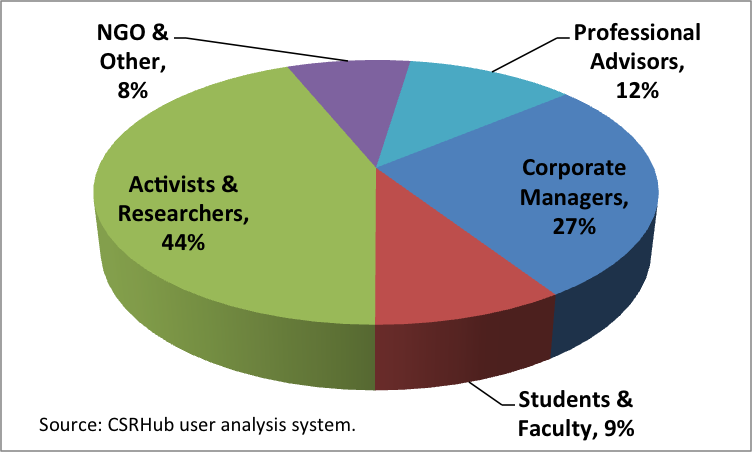 As the chart above shows, about 27% of our users work in large corporations. Another 12% work in the accounting, consulting, and engineering firms, lawyers, ad agencies, and public relations professionals who serve large corporations. Another 44% of our users did not announce an affiliation with a company. We believe that many of these users are businesspeople who join our site because they have a personal interest in sustainability. Others within this group are activists and individuals who need to research corporate social responsibility (CSR) issues. Some of our users have volunteered data on their “demographics.” For instance, 18% of our US users report themselves to be Democrats, 5% are Republicans, 42% call themselves “Liberal” and 34% are Independents. 53% of our users are men, 45% are women and 2% describe themselves as transgender. We have partnered with a number of “social networks” in our area and hope they will help us learn more about our users and their interests. CSRHub provides access to corporate social responsibility and sustainability ratings and information on over 6,700 companies from 135 industries in 82 countries. By aggregating and normalizing the information from 200 data sources, CSRHub has created a broad, consistent rating system and a searchable database that links millions of rating elements back to their source. Managers, researchers and activists use CSRHub to benchmark company performance, learn how stakeholders evaluate company CSR practices and seek ways to change the world.